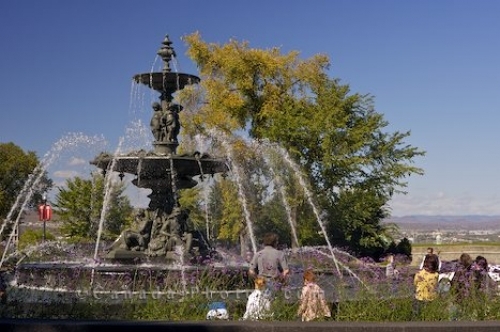 People love to stop and admire the fountain that is displayed outside the Parliament Buildings in Quebec City, Canada. This fountain that is on display outside the Parliament buildings in Quebec City, Canada, has many different tiers with each pool dropping to the one below. In the bottom pool of the fountain, water shoots upwards heading back towards the top two levels and the cycle continues. A great attraction for the many tourists that visit the Parliament Buildings in Quebec City and at night the fountain is illuminated creating a spectacular image. La fontaine de Tourny est mise en eau, fountain outside L'Hotel du Parlement a Quebec, Parliament Buildings in Quebec City, Quebec, Canada. Picture of the stunning fountain on the grounds of the Parliament Buildings in Quebec City, Canada.